Astronomie - New solar flare simulation reveals dazzling beauty of dangerous eruptions This research is teaching us how the sun evolves, and how it affects our daily lives. Raumfahrt - ESA: WAS GLAUBEN WIR, WIE VIEL WIR ÜBER DEN WELTRAUM WISSEN? 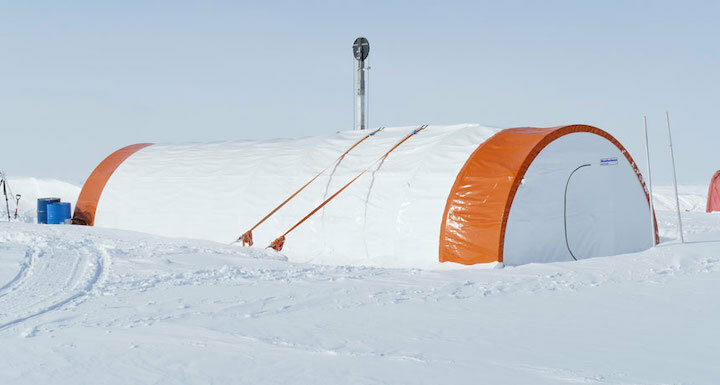 ICE CAMP Researchers working inside this tent at the British Antarctic Survey’s Skytrain Ice Rise site have drilled through more than 600 meters of ice to reach bedrock. Now, a drill once designed for Mars will be used to try to retrieve rock samples. Once destined for Mars, a prototype drill has a new mission: To bore into rocks buried deep beneath the ice in Antarctica. In early January, researchers from the University of Glasgow in Scotland took a modified version of their Martian drill to Antarctica. They’re poised to send it down to the bottom of a 651-meter deep ice borehole completed January 10 by researchers with the British Antarctic Survey, or BAS. The goal is to bring back pieces of Antarctic bedrock that could help determine how long ice has covered Skytrain Ice Rise, a site near the Antarctic Peninsula, and provide clues to its past climate. The original Martian drill, an ultrasonic percussive design, was tested in 2016 in Antarctica, which is often used for as a proxy for research of more far-flung places off the planet. That machine was designed to work in the low gravity of Mars, which makes it tough to apply enough force to bore into hard rock. Ultrasonic vibrations kick the drill into motion, creating a back-and-forth, oscillatory movement that hammers the drill bit down into ground. As the drill was expected to be carried on an unmanned Mars rover, it was also designed to work nearly autonomously. The machine’s small size and ability to work autonomously intrigued scientists with the BAS, who were looking for ways to drill into bedrock sitting at the bottom of a deep ice borehole. Antarctic scientists have portable drill systems for the relatively soft ice, but boring into the hard rock beneath presents a logistical challenge for scientists working on the remote continent, including shipping in a large drilling rig. The small Martian drill, however, could be sent down an ice borehole to drill on its own for bedrock samples. To repurpose the drill for the earthbound site, Glasgow engineer Patrick Harkness and his colleagues had to do away with the ultrasonic component. Since Earth’s gravity is stronger than that of Mars, the potential increase in the hammer forces might stall the ultrasonic action. Instead, the team created a small “rotary percussive” design: The drill hammer travels around a circular inclined plane, delivering its blows on each rotation. That new design is about to be put to the test. The BAS team completed its ice coring on January 10 and will next examine the ice’s chemical composition, including gases trapped within the ice, to learn more about the region’s climatic history. Meanwhile, the Glasgow team is preparing to send its drill down into one of the ice boreholes. The team hopes to collect Antarctic bedrock and measure radioactive isotopes such as beryllium-10 in it. This form of the element, formed by the reaction of cosmic rays with nitrogen and oxygen atoms, decays at a steady rate. So measuring how much of the isotope is in the rock now can reveal when the rocks were last uncovered by ice and exposed to the atmosphere, providing another window into the southernmost continent’s climatic past. Someday, the original Martian drill may be sent to the Red Planet. Harkness says his team is “chatting away with the European Space Agency on a regular basis.” For now, though, the drill will complete its first mission closer to home. In 2016, University of Glasgow scientists traveled to Antarctica to test their autonomous ultrasonic percussive drill (shown here), designed to work in the low-gravity environment of Mars. 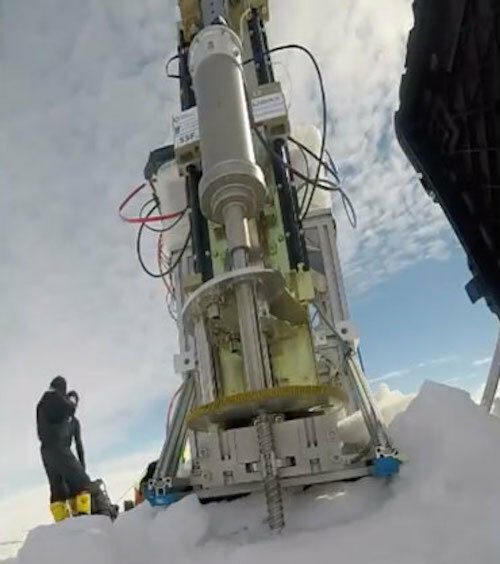 This year, the team is testing a modified version of the drill, which it hopes will be able to retrieve samples of bedrock at the bottom of a deep ice borehole in the southernmost continent on Earth.